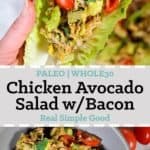 I can’t decide whether I like this Paleo and Whole30 chicken avocado salad with bacon better for lunch or dinner! 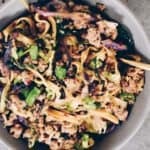 It is creamy, flavorful and satisfying for either meal. Either way, you can make it ahead of time or whip it up in 20 minutes. 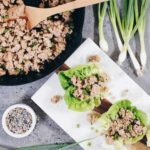 You will love the ease and fuss-free nature of the tasty Paleo and Whole30 friendly ingredients and just how fast it all comes together! I’ve been struggling with gut health, leaky gut and excess bacteria in my gut. Really, it is no surprise I’ve had a flare recently with my autoimmune disease Multiple Sclerosis. Life got real stressful and tough for several months. Couple that stress with my gut issues, and it was pretty much the perfect storm for a relapse. So, I’ve been stepping back a bit, simplifying life and focusing on healing my gut. It’s hard. I’m not gonna lie. It is really hard to be SO intentional with everything I eat and put in and on my body. But, life is such and it’s all a journey. I’m trying to find ways to enjoy this process and the journey because that’s what it is all about right? You’ll never be truly happy when you finally reach your destination if you don’t fall in love with the process and journey to get there. Part of healing my gut means that I’m taking things back to square one a bit and eating really simple, nutrient dense foods. And with being more intentional, I’m finding that going for super simple and quick recipes is key right now. It helps me feel like all the effort is just a little less overwhelming and doable. 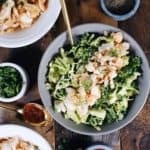 I love this chicken avocado salad with bacon because it has creaminess without mayo (because I’m not eating eggs right now) and tons of flavor. 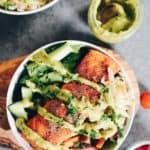 It’s loaded with healthy fats from the avocado, flavor from the bacon and jalapeño (if you opt for using it – we’ve only been using it without the seeds so it’s not spicy). Add some red onion, tomatoes and seasonings and lime juice and call it good! 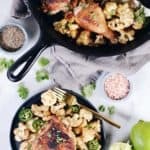 We like to use leftover chicken for this recipe, which usually ends up being one of two things. Either we’ve made some chicken thighs in the Instant Pot or Slow Cooker, and it’s shredded and ready to use. Or we’ve made a full chicken and have leftovers in the fridge. 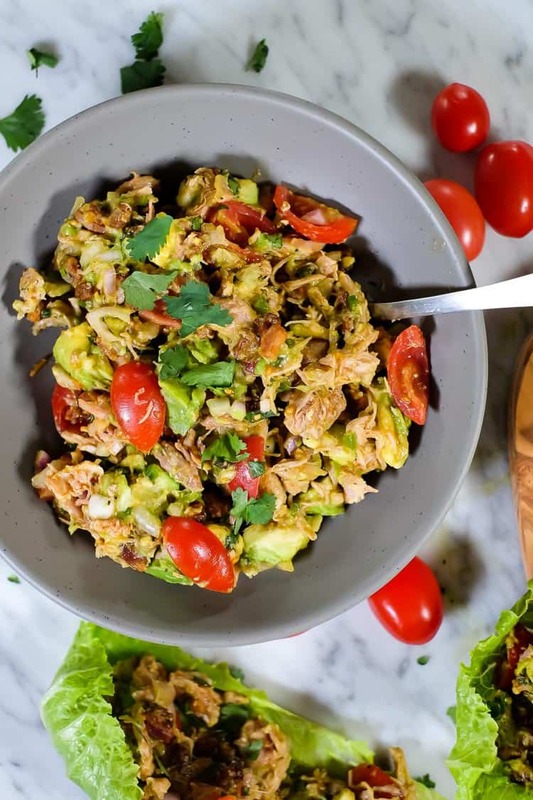 Either way, whenever you have leftover chicken on hand, this chicken avocado salad with bacon is the perfect way to use it up! 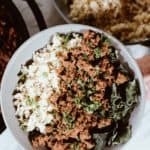 It comes together in just 20 minutes and you can enjoy it for a quick and easy dinner or make ahead lunches. 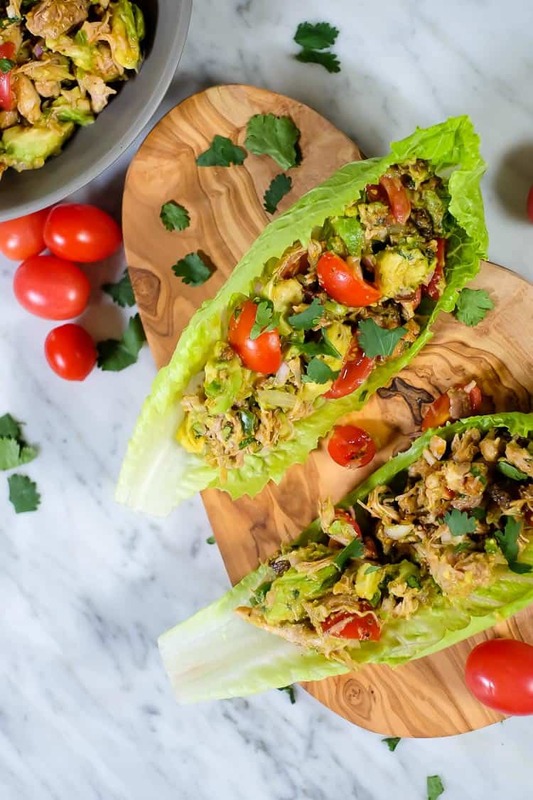 Pack some romaine or other broad leaf greens and load them up for lunch while you’re at work. 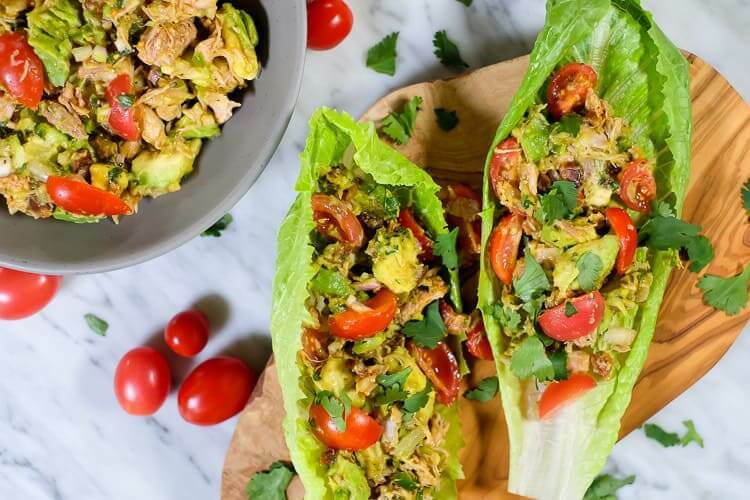 Use your leftover chicken to make this chicken avocado salad with bacon and enjoy the simple, flavorful meal! Let us know how it goes by leaving a comment below. Also, take a photo and tag us on Instagram @realsimplegood, so we can check it out! And if you don’t already, give us a follow on Instagram! 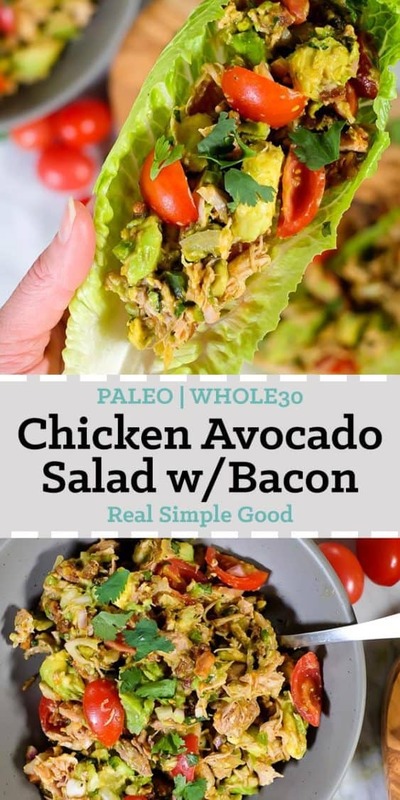 This Paleo and Whole30 chicken avocado salad with bacon is creamy, flavorful and satisfying! You can make it ahead of time or whip it up in 20 minutes. 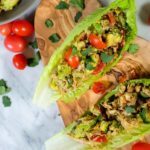 You will love the ease and fuss-free nature of the tasty Paleo and Whole30 friendly ingredients and just how fast it all comes together! Cook chicken as desired and allow it to cool. (We like to use salsa chicken for more flavor - just add the chicken to a crockpot and pour in a jar of salsa. Cook on high for 3 hours and shred with a fork. You could also cook it in the instant pot on the manual setting for 20 minutes with a quick pressure release. Remove with a slotted spoon.) Shredded rotisserie chicken would work also. Dice bacon and heat a large skillet over medium heat. Once hot, add in the bacon to cook, stirring occasionally, until it is cooked and crispy. Remove and place on a paper towel lined plate to cool. Combine the remaining ingredients in a bowl. Add in the cooled chicken and bacon. Toss everything to mix and mash-up the avocados some (but leave it chunky). 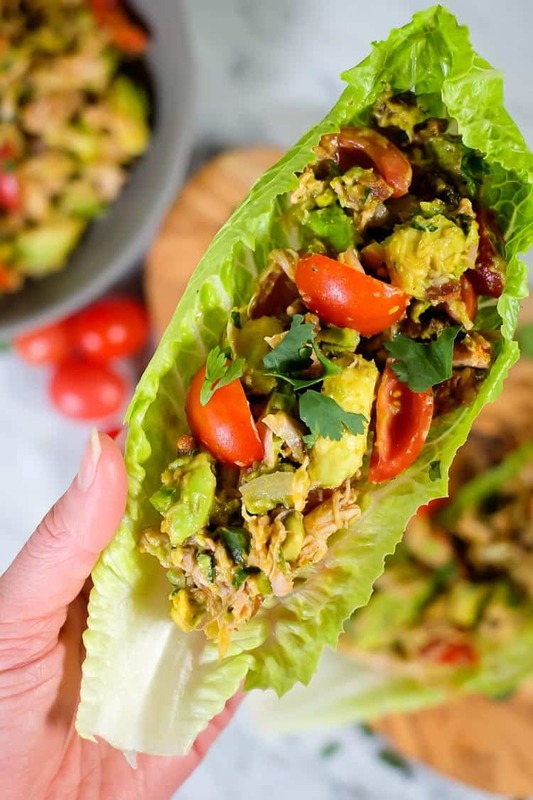 Serve the chicken avocado salad on it's own in a bowl, in a grain-free tortilla or on a lettuce leaf. Enjoy!